Looking at my WordPress dashboard, it’s clear to me that a good deal of the traffic coming to my blog in the last few weeks is from people looking for NaNoWriMo tips. I mostly post updates about my own work, with a few exceptions where I talked about general tips, so I decided to try to post something more along the lines of what those readers are looking for. When it comes to NaNoWriMo (and writing in general) there’s not really a right way or a wrong way. I could spout (and have spouted) lists of rules on grammar and spelling and word usage and on and on, but breaking those rules won’t necessarily make your book bad any more than following them will make it good. 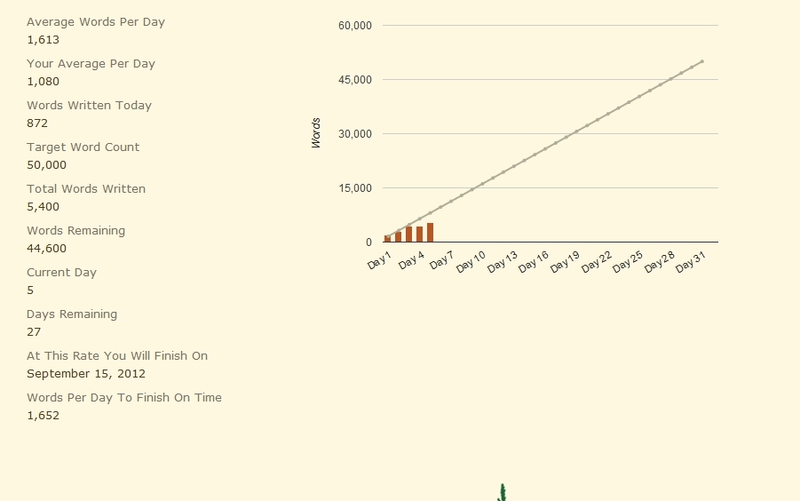 That said, when you approach NaNoWriMo, there’s a good chance you haven’t written much (or anything) before. That’s part of what NaNo is meant to change. 1. Write every day. Write a blog post, write a poem, write utter nonsense as it pops into your head, just write. Think of this as stretching before a run; you’ll get your creative juices flowing, get your fingers moving, and get yourself relaxed and comfortable and thus in a position to write. As a bonus, since the goal of NaNoWriMo is to just finish a novel, not necessarily a publishable one, you might even be able to run that “utter nonsense” I mentioned into a NaNo winner. The chances that said project will be particularly good may not be high, but you’ll never know until you write it. 2. Don’t freak out if you fall behind. Don’t freak out at all really, but if you find yourself a thousand or two thousand or ten thousand words behind, don’t flip your keyboard and walk away from your computer. Just take a minute, breathe, and figure out what’s keeping you behind. Are you stumped? A lot of people will tell you to throw a plot twist from left field to keep you on your toes. It’s sound advice that works for a lot of NaNo participants, but it’s never really worked for me. Give it a try and see how it goes, and if it works, great. What I normally do in that situation is just brainstorm. Usually when I write something I keep notes on some iOS app or another (usually just the stock Notes app, though I’ve used list apps and mindmap apps as well). Any thought I have relating to my story I write down. Should I find myself unable to progress, I get the list out and go over it and try to figure out where this story is going. I also write down ideas I’m not sure I’ll use, and sometimes one turns out to be the perfect thing to put into my story. It’s kind of like the above advice, but a little bit less random, which keeps my story a little more coherent than if I just make something up on the spot. As you can see, I’m a little behind. The NaNoWriMo website does a lot of math for you, and it’s a good way to keep things on track. At this rate I’ll finish halfway through September, which isn’t a NaNoWriMo winner, but that stat will change if I write a little more. A little can go a long way with NaNoWriMo, and in my case 1652 words per day would have me finishing on time. Now think of this: If instead I write 1700 words per day (less than fifty extra) I’ll finish a day sooner. And if I throw in an extra 150 per day and do 1800, I’ll finish in 24 days (and currently I have 27 left to go). If you find yourself behind, don’t feel compelled to rush and catch up. Adding a few hundred words per day might sound like a lot, but an average page tends to fall near 250 words, so if it helps you to think in terms of pages, writing an extra page per day can not only get you caught up quickly, it can put you way ahead. 3. Write now, edit later. It’s better to have too much in a first draft and cut away than have too little and need to tack scenes on later. This is especially true when it comes to NaNoWriMo. The goal is 50,000 words, which is actually pretty short for a novel, and anything too much shorter will usually not be a publishable book, unless you’re going for middle grade. That said, don’t be afraid to fluff things up for your NaNoWriMo project. You can (and should) always cut things down a little bit when you revise, and you never know when something you add now will turn out to be not fluff but setup for an epic plot turn 30,000 words from now. Not everything works for every writer. Chances are you’ll know better than I or anyone else on the internet what does or doesn’t work for you, but you usually won’t just know it, you have to try a few things and learn what gets the gears going. But it won’t hurt to try things that work for others and see if they also work for you. Hopefully you can find something here to help you along your way. If anyone else has any tips to add, feel free to leave a comment. What works for you? What do you do when you find yourself behind?